Germination benefits greatly from cold conditioning/stratification, approximately 8 weeks at 5°C (40°F) or colder. Typically seed is sown on moist sterilized potting soil (in plugtrays - 72 cell trays are popular) during the winter and placed outside for two months or more, preferably with snow cover. Seeds can be covered lightly or pressed into the soil surface, but should not be buried too deeply or allowed to dry out completely. 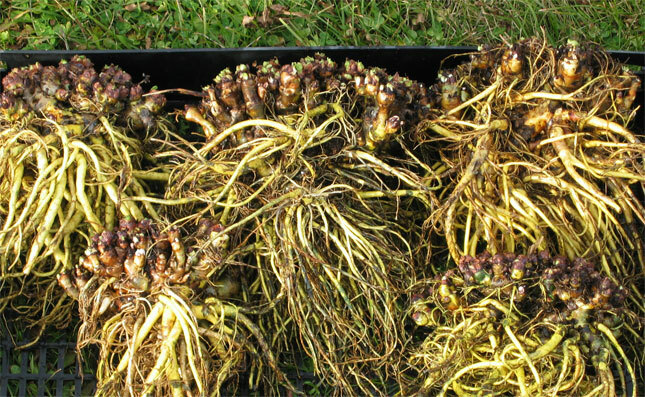 In Canada, sprouts appear in late April or early May, after daytime temperatures increase, and can withstand significant frosts. Young seedlings do better in a location semi-sheltered from sun and wind. They grow slowly, suffering both when the soil remains saturated with moisture for extended periods and when the soil becomes very dry. Thus a balance between overwatering and drought conditions should be maintained. Mild fertilization may be beneficial, but is not required. After a month or two, when a stalk is sent up from the rosette of seed leaves, seedlings can be exposed to more sun to maximize growth. Seedlings can be transplanted in their first year, but can also be kept in plugtrays for a year or two to minimize weeding in the field. Excellent transplant survival rates can be achieved any time the ground is not frozen, even with dormant (leafless) plugs in the fall. Eventually plant growth will suffer if seedlings are not planted out. Ideal growing site components include full or almost full sun, good drainage during the spring runoff and some shelter from the wind. While the latter is not imperative, it will help conserve soil moisture and enhance growth. R. rosea is very drought tolerant and does not require irrigation, however, it will benefit from regular watering - natural or otherwise. Field spacing depends on the chosen weed control system, especially if plastic mulch is used. One foot in-row spacing, with eight-inch between-row spacing of plants is an average for current trials, giving three to four rows of plants per (mulched) bed. Path spacing between beds will vary with the weeding regime, or a solid (pathless) planting may be preferred. Time to harvest can be as short as three growing seasons, when roots can attain 0.75% rosavin content or better, though four to five year's growth will provide greater root biomass and a rosavin content of 1% or more. The roots tend to deteriorate from within as they age, harboring patches of necrotic tissue (or "heartrot") to which they will eventually succumb. The upshot is that - while there may be 75-year old plants in the wild - the maximum age of a commercial field may only be six or seven years. The dynamics of root attrition due to disease are not yet understood, and may differ with various cultivars and soil conditions. Initial indications are that fertilization is not beneficial under normal conditions. R. rosea is an adaptable species, and as such appears to do well in a variety of soil types, from rocky gravel through heavy clay to silty, sandy and peaty loam soil types. As a circumpolar species, Rhodiola does well at high latitudes, where its production of rosavins assists survival under harsh conditions. For harvesting, the roots should be well washed, sliced into thin strips and dried. The dried root is best stored in an airtight container in a cool dry, dark place, and will keep for up to 3 years.